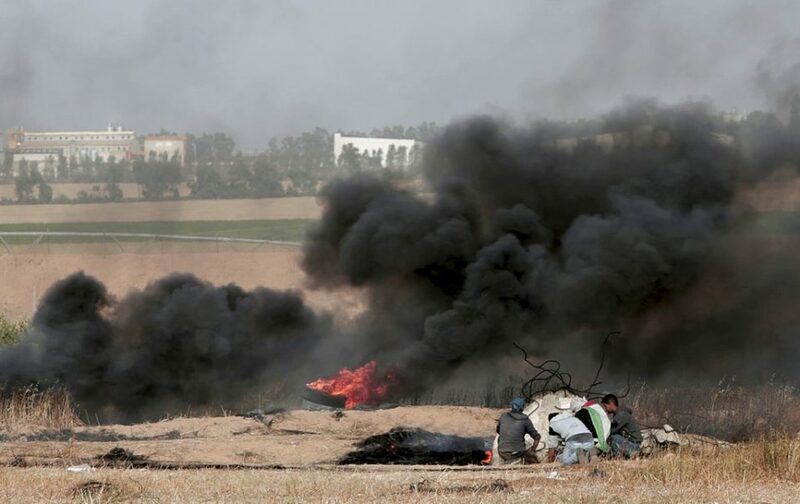 Last week Hamas, the elected terrorist government of Gaza, launched protests and riots along its border with Israel. It dubbed the campaign, “March of Return.” The “Return” refers to the Palestinians’ demand of nearly 70 years that refugees from its 1948-49 war against Israel (Israel’s War of Independence) return to and flood the Jewish state, together with their millions of descendants. The “March” is a call for multiplied thousands of Gazans to march to – and actually across – the Israeli border. Hamas threatens to continue this violent, riotous march until May 15, when the US moves its Israeli embassy to Jerusalem. Many believe Hamas is trying to provoke Israel into starting a war – at least according to world opinon. God contends against those who contend against Israel: “Whoever touches you touches the apple of My eye.” (Zechariah 2:8) In this context, touching the apple of God’s eye is like poking a finger in the eye of YHVH. Those who dare do this will find their own vision seriously obscured. Sadly, the eyes of many of the people of Gaza have been blinded. Unrelenting hatred of Israel has caused a fatal obscuring of their vision. Truth hides from them in darkness, deception and death. They know little or nothing of a Creator who loves them. Their greatest hope may lie with those of us who will forgive them and pray for them. Israel’s last war with Gaza broke out in 2014. Back then, while praying into the conflict, I sensed the Lord speak to my heart. “Will you persevere in prayer for My purposes against Gaza’s enemies with the same passion you would concerning Israel? For Israel and Gaza have the same enemies. Those enemies want to kill and destroy both peoples.” At that moment I saw how Gazans had been overtaken by some of Satan’s cruelest and most powerful, tormenting demonic forces. My attitude toward Gaza has been different ever since. Some of the prophets pronounce judgments of God against Gaza. (Jeremiah 25:20; 47:5; Zephaniah 2:4, Amos 1:6-7) The most relevant for declarative prayer today is Zechariah 9:5-8. Zechariah, whose name means, “The Lord Remembers,” ministered during Israel’s first return from exile and restoration.Today, we believe God to remember His Word concerning His enemies during Israel’s second (and present) return from exile and restoration. We also keep in mind and heart that we do not battle or pray against flesh and blood, but against evil forces and demonic entities who are common enemies. As we pray, we continually hold up God’s purposes for the salvation of Gaza, as well as Israel. We release this conflict to Him in the authority of the Spirit for the sake of His Kingdom. Peace on Israel and Gaza (“Praise your God, O Zion, for He strengthens the bars of your gates and blesses your people within you. He grants peace to your borders.” Psalm 147:12-14). Scattering of the enemy (“May God arise, may His enemies be scattered. As smoke is blown away, may You blow them away.” Psalm 68:1-2). Confusion of the enemy. (Joshua 10:10). Wisdom, restraint and divine strategy for the Israeli army, ground troops and military decision makers. Clear and truthful communications between all branches of Israel’s armed forces, as well as between military and the political leaders. Accurate and thorough military intelligence. Angelic protection for Israeli troops and civilians near the border, as well as for civilians from Gaza, with minimal harm on both sides. Exposure of lies and distortions in media and international diplomacy. Revelation of YHVH in Israel, Gaza and the nations through this conflict, revealing His glory and drawing many to Him. Release of Gaza into its redemptive destiny – a stronghold within Judah and region of praise to God. “See how Your enemies are astir … pursue them with Your tempest … Let them know that You, whose name is the Lord, that You alone are the Most High over all the earth.” (Psalm 83:2,15,18). Your ticket for the: Uprising at the Gaza Border: Could it lead to spiritual breakthrough?